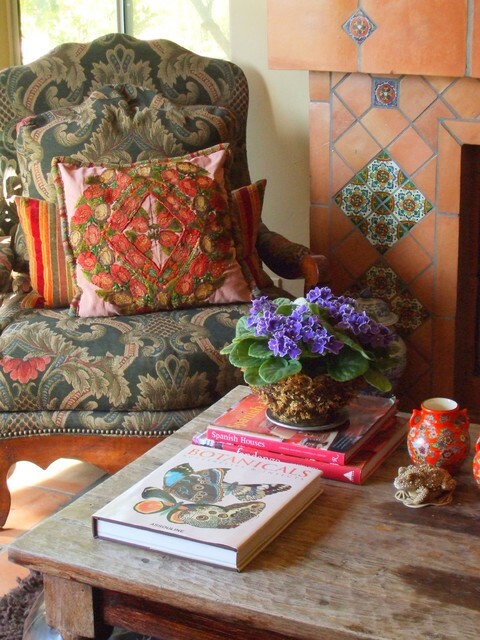 Old California style with a mix of rustic and casual brocade fabrics, Mexican tile, worn wood tables and a vibrant floral pattern rug. Tiles on Fireplace - Hello, can you please tell me where the tiles on the fireplace can be purchased? Tell a story. Michael believes every home should reflect the interests, travels and inspiration of its inhabitants. “Creating a pretty space isn’t enough,” she says. “It needs to tell the story of the people who live within it.” Her own home is filled with novelties — such as insects, shells and even a bird’s nest — that she has collected since she was a child.Want a glamorous home that exudes a comfortably casual vibe? Read on for Michael’s top tips.